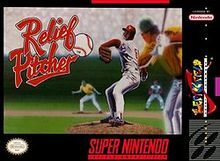 Relief Pitcher for Super Nintendo give you the option of either playing the role of a relief pitcher entering the game in a crucial late-inning situation or you can play a nine-inning game controlling the batters, pitchers, and fielders on your team. There are four unique ballparks to play in, and you can play a single game or see if you can take the ups and downs of a full season. Announcing legend Jack Buck calls all the action on the field, and you can go head-to-head against a friend in intense two-player action.